Home > Vision > What Are Photoreceptors? Photoreceptors are specialised cells found in the retina at the back of the eye. They allow us to see contrast and shade and the definition of objects, and also to see what colour those objects are. Photoreceptors are specialised cells found in the retina at the back of the eye. They are responsible for vision, both in terms of the way we see contrast and shade and the definition of objects, and also for our ability to see in colour. The two types of photoreceptor in the human retina are called rods and cones. We have far many more rods than cones; the average retina has 120 million rods compared to only 7 million cones. The rods and cones are arranged in a very specific way in the retina; the rods are mainly distributed on the periphery whereas the cones are concentrated in the centre, in a location defined as the macula. This appears in the eye as a yellowish spot and is the part of the retina that gives us our finest vision. Visual acuity – the ability to focus intently on the object in the centre of our vision – is high because of the dense packing of the cones in the very centre of the macula, the fovea centralis. This tiny spot on the retina contains only cones – there are no rods at all. Both types of photoreceptor are modified nerve cells. They have an excitable membrane that is capable of receiving a stimulus – light – and converting detection of that stimulus into nerve impulses. So, when light enters our eyes and falls on the retina, this causes the photoreceptors to react, turning the images coming in to electrical signals that are then passed to the brain to be decoded in the visual centre. Most nerve cells are long and thin with connection points at one end that look like tendrils, but are termed dendrites. Both rods and cones have dendrites at one end; these connect to nerve cells that lead to the optic nerve and the brain. The ‘business end’ of the photoreceptor, however, is very different to a typical nerve cell. 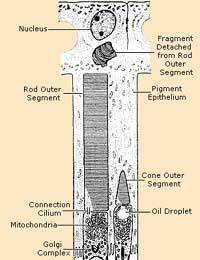 Both rods and cones have a large bulbous structure at the end of the cell that faces the pupil of the eye. This is packed with chemicals and enzymes that are photosensitive and that undergo chemical changes when light hits them. The main visual pigment in humans is called rhodopsin, which is made up of opsin, a protein, and retinal, a molecule derived from vitamin A (which is why a deficiency of vitamin A in the diet can lead to night blindness and other vision problems). Cones are responsible for colour vision and, as you might expect, there are three types, one for red light detection, one for green light and one for blue light. All work together to enable us to see all of the colours in the spectrum of white light. We don’t have equal numbers of each type, however. Red cones are by far the most plentiful accounting for 64% of the total; green cones are the next most common, accounting for 32%. Blue cones only make up 2% of the cones found in the human retina, but these are extremely sensitive, which compensates for their low concentration. The cones concentrated into the fovea centralis in the macula allow us to focus on a single object and see it in great detail. When this area of the retina becomes damaged, as it can in several retinal diseases such as age-related macular degeneration and retinal vein occlusion, losing this central vision can prove devastating. Rods are more plentiful and also more sensitive than cones. They do not allow us to see colour, so there is only one type of rod, but they can detect light at very low intensities and some reports suggest that just one single photon is enough to trigger a response in a single rod cell under perfect conditions. Rods also allow us to detect motion of objects very well and as rods are spread throughout the periphery of the retina, rod are responsible for being able to see something moving ‘just out of the corner of your eye’. Only one part of the retina is completely devoid of photoreceptor cells. This is the small circular area where the optic nerve leaves the back of the retina to link up to the brain and is known as the blind spot. A simple visual test can show you that the blind spot exists – draw a spot about 5mm in diameter and a cross about the same size on a piece of paper about 8cm apart. Hold the paper about 50cm away from your eyes and then bring it closer while staring at the spot. At some point the cross will disappear – the light coming from it has just hit your blind spot. What Does it Mean to Be Legally Blind? What Makes Colour Vision Possible? I have a 10 year old grandson who was diagnosed at apx 2 with cone and rod dystrophy eye disease.Please help with any treatment options being developed, any treatment to preserve eyesight he has, etc.Any and all help will be so greatly appreciated!Have read, but do not understand there is stem cell and DNA replacement therapy.Are they progressing in these studies? My precious grandson is a brilliant little boy; his knowledge far beyond that of a 10 year old.He excels in all his studies....100% on sat and all testing.I am literally sick about this eye disease, and have recently notin\ced my grandson is acting very distressed and I know it;s the disease!He is afraid.If you can offer ANY advice, PLEASE HELP!